1) Shuttle bus service direct from the Airport to Pirate’s front door. Contact us and we can arrange this for you. 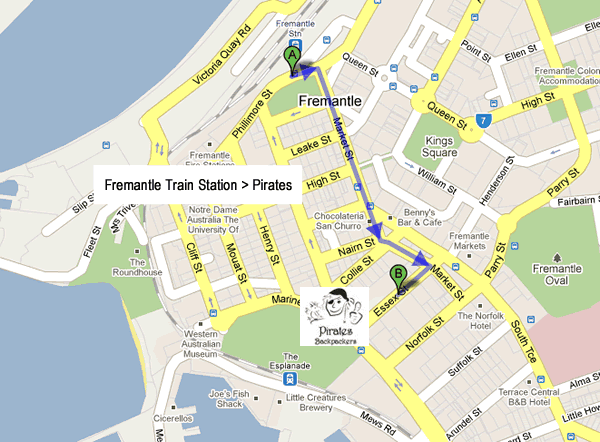 2) Catch the Fremantle Train from Perth City. On arrival walk from the Fremantle Train Station straight down Market Street which becomes South Terrace. Approx 300m down South Terrace, turn right at Essex Street (Hungry Jacks is on the corner). We are on Essex Street on the left. 3) From the ferry head to the train station across the footbridge, then follow the directions from the Train Station. Any problems just give us a call!